This chapter summarises the climatic and environmental information that can be inferred from proxy archives over the past 12,000 years. The proxy archives from continental and lake sediments include pollen, insect remnants and isotopic data. Over the Holocene, the Baltic Sea area underwent major changes due to two interrelated factors—melting of the Fennoscandian ice sheet (causing interplay between global sea-level rise due to the meltwater and regional isostatic rebound of the earth’s crust causing a drop in relative sea level ) and changes in the orbital configuration of the Earth (triggering the glacial to interglacial transition and affecting incoming solar radiation and so controlling the regional energy balance). The Holocene climate history showed three stages of natural climate oscillations in the Baltic Sea region: short-term cold episodes related to deglaciation during a stable positive temperature trend (11,000–8000 cal year BP); a warm and stable climate with air temperature 1.0–3.5 °C above modern levels (8000–4500 cal year BP), a decreasing temperature trend; and increased climatic instability (last 5000–4500 years). The climatic variation during the Lateglacial and Holocene is reflected in the changing lake levels and vegetation , and in the formation of a complex hydrographical network that set the stage for the Medieval Warm Period and the Little Ice Age of the past millennium. The evolution of the coastline in the Baltic Sea area since the end of the last deglaciation has been the object of study for more than one hundred years. Despite this, some questions remain concerning both the chronologies of the transgression –regression phases of the prehistoric Baltic Sea basins and their spatial characteristics. Nevertheless, the long-term change in environmental conditions does provide information about the magnitude of natural climate and environmental variability , both that resulting from external climate drivers and that internally generated. This knowledge is important not only for understanding the mechanisms driving variability and the trend in climate change over centennial timescales, but also to estimate the extent to which future climate could deviate from the monotonic long-term global trend caused by increasing concentrations of atmospheric greenhouse gases . At regional scales, deviations from the global average can be substantial and should be accounted for when designing regional policy for adaptation to climate change. Littorina Sea stage. A brackish water basin, ca. 9500 cal year BP to present (Hyvärinen et al. 1988; Björck 1995, 1999; Andrén 2003; Andrén et al. 2002; Heinsalu and Veski 2007; Zillén et al. 2008). From colonisation by freshwater molluscs, the Limnea Sea has been dated at 4400 cal year BP and located in northern Estonia (Saarse and Vassiljev 2010). The Baltic Sea basin and the Atlantic Ocean have exchanged water masses over almost their entire history. The exchange has been modulated both by glacio-isostatic land uplift and by eustatic (water volume) changes in sea level. Approximately 250 years after the final drainage of the Baltic Ice Lake, seawater flowed into the Baltic Sea basin through the Närke Strait in Billingen following a rapid rise in sea level resulting from the melting of the Scandinavian ice sheet (Yu 2003). This caused the Baltic Sea basin to become a brackish basin between 11,700 and 10,700 cal year BP (Yoldia Sea stage). Subsequent climate warming caused rapid melting of the continental ice sheets and pronounced isostatic uplift led to the isolation of the Baltic Sea basin from the Atlantic Ocean, turning it into a large freshwater lake (Ancylus Lake) . The culmination of the transgression phase of this lake is dated to ca. 10,700 cal year BP (Yu 2003). The Ancylus Lake stage lasted until approximately ca. 9500 cal year BP. The modern Baltic Sea basin is part of the Littorina stage during which sea level and salinity have varied considerably (Miettinen et al. 2007). 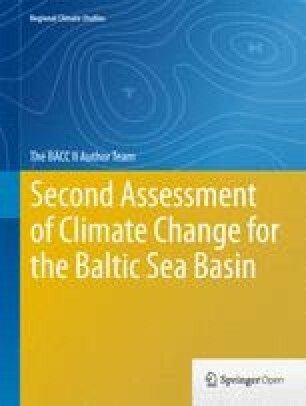 Climate change in the Baltic Sea basin during the Holocene has been the result of various external and internal factors: changes in incoming seasonal solar radiation due to slow changes in the Earth’s orbit, variations in the concentration of stratospheric aerosol caused by volcanic activity , change in the greenhouse gas content of the atmosphere due to natural factors, change in surface albedo of the sea-lake itself and in the surrounding land vegetation, and change in the intensity and type of circulation due to changes in basin salinity. The widely varying lake levels and vegetation changes and the formation of a complex hydrographical network together indicate a complex pattern of climatic change in the Baltic Sea region through the Lateglacial and Holocene. These environmental changes also affected the stages of human migration in this territory during this period. This chapter summarises the climatic and environmental information that can be inferred from proxy archives of the Baltic Sea basin. These cover approximately the past 12,000 years and include different types of proxy data, mostly from continental and lake sediments , insect remnants, and isotopic data. There is also a brief discussion on the sources and mechanisms of externally driven and internally generated climate variability at timescales relevant for the Holocene. Climate variability in the Baltic Sea basin over the past 12,000 years has been caused by changes in external climate drivers, or internally generated by nonlinear dynamics and interactions among the different components of the climate system. During the deglaciation that began in the Last Glacial Maximum and later in the Holocene, the main external climate drivers were the modulation of the orbital parameters of the Earth, change in the solar irradiance , volcanic activity, change in the properties of land cover (see Chap. 25), and the concentration of greenhouse gases in the atmosphere. Distinguishing between external and internal drivers is a matter of perspective. For instance, the effect of greenhouse gases and changes in the land surface are usually considered external climate forcers. However, if changes in the biosphere and the dynamics of the carbon cycle are included as interactive components of the climate system, these would constitute a source of additional internal variability . This apparent contradiction can be illustrated using the example of large-scale circulation patterns. From a regional perspective, they may be considered external climate forcers, whereas changes in the circulation patterns may in fact be due to changes in the external radiative forcing or simply the result of internal climate variability, partly also due to processes originating within the Baltic Sea region itself. According to present knowledge, the externally forced climate variability in the Baltic Sea basin is most likely to be due to orbital forcing at millennial timescales, to changes in solar irradiance at multi-decadal or centennial timescales, and to volcanic activity at annual to multi-decadal timescales. The multi-decadal climate response to volcanic forcing arises because, although the climate effect of a single volcanic eruption may just last a few years, there exist multi-decadal periods where the frequency of eruptions has been considerably greater than average, for reasons yet unknown. A series of eruptions can then tip the climate system to a colder state giving rise to a longer-lasting climate response (Borzenkova 2012; Miller et al. 2012). The only source of external climate forcing that can be accurately calculated is the Earth’s orbital forcing (see Fig. 2.1 for an illustration of the Late Holocene trends). For longer periods, the evolution of solar insolation deviates too strongly from linearity to be represented by linear trends. Variations in the position of the point of the orbit closest to the sun (perihelion), the obliquity of the Earth’s axis and the eccentricity of the orbital ellipse, redistribute the incoming solar energy through the seasons and across latitudes. Although it is acknowledged that orbital variations are the main cause of the recurrence of glacial and interglacial periods, orbitally induced temperature variations can be reinforced by other factors, such as natural variations in atmospheric concentrations of greenhouse gases . The precise mechanisms that result in the interglacial successions , and thus caused the last deglaciation that extended from 20,000 to 10,000 cal year BP, are still not completely understood, and climate models are not yet able to reproduce the millennial-scale evolution of the rise in global sea level since the Last Glacial Maximum as reconstructed from proxy records (Brovkin et al. 2012). Since obliquity and eccentricity vary over longer timescales, the most important orbital factor during the relatively short Holocene period was the shift in the perihelion, from July 10,000 years ago to its current position at the beginning of January. Thus, northern high-latitude summers have received diminishing amounts of solar insolation over the past few millennia, with a linear trend more negative than −5 W m−2 per thousand years at the latitudes of the Baltic Sea region (about 60°N). In contrast, winter, spring, and autumn have received increasing levels of insolation over the Holocene . Since most proxy records reflect summer mean temperature or the temperature in the biological growing season, the millennial trends or the changes between mid-Holocene and present reflected in the proxy records should be interpreted based on biological knowledge about that particular proxy. Solar irradiance , the energy of the sun reaching the upper layers of the atmosphere (the solar ‘constant’), also varies over all timescales due to internal solar dynamics. Past solar irradiance can be approximately reconstructed and dated by analysing the concentrations of cosmogenic isotopes, beryllium-10 (10Be) in polar ice cores and carbon-14 (14C) in tree rings, and over the past 400 years from the reported number of sun spots (see for instance, Crowley 2000). Although the general shape of the time evolution for solar irradiance is generally agreed upon, the magnitude of its variations at centennial timescales is still contended. Some authors suggest values of the order of 0.5 % of the total solar constant (Shapiro et al. 2011), while others interpret the isotopic record to indicate typical changes of the order of 0.1 % (Schmidt et al. 2011). The recent reconstruction by Shapiro et al. (2011), displaying amplitude of centennial variations of the order of 0.5 %, has been critically assessed by the climate research community. Figure 2.2 illustrates the wide range of uncertainty between two multi-millennial reconstructions of total solar irradiance by displaying two extreme estimates, both very recent. Thus, it is still unclear whether cooling or warming events can be confidently attributed to changes in solar irradiance alone, even when they are coincidental with periods of markedly different solar irradiance , or whether reinforcing mechanisms must be invoked (Shindell et al. 2001). Over the past millennium, for which more reliable reconstructions of volcanic activity exist than for previous periods, this situation is compounded by coincidences between solar minima and clustering of volcanic eruptions, as for instance during the Late Maunder Minimum and the Dalton Minimum . It is not known whether this coincidence also occurred prior to the past millennium. Past volcanic forcing can be reconstructed for recent centuries and, but with greater uncertainty, for the past few millennia by analysing the acidity of ice layers in polar ice cores (see Schmidt et al. 2011 for a thorough discussion). Volcanic eruptions produce vast amounts of sulphate aerosols which are transported through the stratosphere and deposited on snow and ice. The intensity, location, and seasonality of the eruptions (all important factors for estimate their climate effect) can only be indirectly inferred, which increases the uncertainty of estimating past volcanic forcing. Over the pre-industrial period, volcanic forcing is likely to have been the major factor driving external climate variability at multi-decadal and centennial timescales (Hegerl et al. 2003; Borzenkova et al. 2011; Borzenkova 2012; Miller et al. 2012). For periods further back in time, the lack of data precludes a robust inference. Atmospheric concentrations of carbon dioxide (CO2), methane (CH4) and nitrous oxide (N2O)—greenhouse gases—have varied strongly since the Last Glacial Maximum and, albeit in a more subtle way, during the Holocene . Atmospheric CO2 levels rose from 180 to 280 ppm between the glacial state and the start of the Holocene 10,000 cal year BP (Borzenkova 1992, 2003; Blunier and Brook 2001; Flückiger et al. 2002). Since then, there has been a slight, and intriguing, positive trend, the causes of which are unclear (Ruddiman et al. 2011). Ideally, the external forcing mechanisms described in this chapter could be used to drive a global climate model that would simulate the Earth’s climate over the Holocene. To date, this has only been possible using simplified climate models, since the computing requirements needed to reconstruct a period of several thousand years are considerable. These ‘models of intermediate complexity’ cannot adequately represent the Baltic Sea basin. Although the first simulations with comprehensive ocean–atmosphere global models covering the past 7000 years have recently been completed (Hünicke et al. 2010), the resolution of these models is still insufficient for a realistic representation of the Baltic Sea. For example, in these models the North Sea–Baltic Sea gateway is either closed or is 700 km wide. To properly simulate the climate of the Baltic Sea area, regional atmosphere–ocean models with a high spatial resolution are required (see Chap. 10). Such models, however, have not yet been applied for the long timescales of the Holocene. This is a task that could be envisaged for the coming decade, as it is not presently feasible. However, some ongoing projects will soon be able to simulate particular time slices (e.g. a few hundred years), of the Baltic Sea climate in the Holocene . A regional simulation of the past millennium was recently performed at the Swedish Meteorological and Hydrological Institute (Schimanke et al. 2012, see Chap. 3); this time span will hopefully be expanded back into the past. In addition to the external climate drivers , nonlinear mechanisms within the different components of the climate system give rise to internal climate variability over all timescales. At the timescales relevant for the Holocene as a whole, multi-centennial and millennial, interaction between the hydrosphere and ocean dynamics are believed to have been the main factors modulating the climate variability superimposed on the millennial trends caused by the orbital forcing . Perhaps the best known episode of multi-centennial climate variability in the Holocene is the ‘8.2 ka cold event’; a sudden cooling that lasted for about 200–300 years, and that has left its imprint on many proxy records around the North Atlantic basin including northern Europe, as reported in several comprehensive reviews (Alley and Ágústsdóttir 2005; Rohling and Pälike 2005). A series of modelling studies (Renssen et al. 2001) supported the idea that the 8.2 ka cold event was caused by a sudden slowdown of the North Atlantic Meridional Overturning Circulation (AMOC), itself caused by a sudden release of melt water from the remnants of the Laurentide Ice Sheet into the North Atlantic Ocean. However, a large uncertainty concerning the volume of melt water which may have been discharged, its timing and the discharge rate still remains. According to this mechanism, freshening of the surface waters in the North Atlantic Ocean hindered oceanic convection and the deep-water formation that is typical of the present climate, thus reducing the amount of heat flux from the ocean to the atmosphere and also slowing the northward heat advection by the North Atlantic currents. Oceanic convection would have resumed once the anomalously fresher seawater in the high-latitude North Atlantic Ocean had been re-distributed through the world ocean, which would have required a period of a few hundred years (Clark 2001; Clark et al. 2002; Clarke et al. 2004). Pollen records from mire deposits, lake sediments and sea sediments have been used to reconstruct climate variability during the Late Glacial and the Holocene periods. New quantitative information has been obtained from pollen and chironomid data over the past few years due to more detailed analysis and 14C dating of sediments. The new insights are based on calibration of the modern pollen, diatom and beetle fauna data to climate parameters (annual and seasonal air temperature and annual precipitation) using different types of transfer functions (Birks 2003). However, the results from earlier investigations are still relevant. The most recent and carefully investigated sediment sequences used for climate reconstruction stem from the following lakes: Svētiņu (Veski et al. 2012), Kurjanovas (Heikkilä et al. 2009), Busnieks (Grudzinska et al. 2010; Ozola et al. 2010), mires : Cena (Kalniņa 2007, 2008), Eipurs, Dzelve (Kuške et al. 2010a), Rozhu (Kuške et al. 2010b) and from archaeological sites at Lubans (Kalniņa et al. 2004), Sarnate (Kalniņa et al. 2011) and Priedaine (Cerina et al. 2010) (see Table 2.1). Some of the pollen records have been re-interpreted using the model REVEALS. This model estimates the relative species composition in a region from the pollen counts found in lake sediments layers, describing the dispersal and deposition of pollen and taking into account inter-species differences in pollen productivity (Sugita 2007; Ozola and Ratniece 2012). There are three established ways of using palaeobotanical data for palaeoclimatic reconstructions. All three involve the use of plant species (or sometimes genera) as climate indicators together with statistical methods to infer climate by mapping vegetation composition on climatic zones. Because these methods all extrapolate the ecological requirements of modern plants back into the past, this necessarily introduces a certain degree of uncertainty. The first method was published by Iversen (1944), who examined the modern distributions of Ilex aquifolium (holly), Hedera helix (ivy), and Viscum album (mistletoe) in northern Europe and established a relationship between their occurrence and mean summer and winter temperatures . This approach is still applied to quantitative palaeoclimatic reconstructions (e.g. Zagwijn 1994). The second method, developed by V.P. Grichuk from Iversen’s method, is known as the mutual climatic range method (Grichuk et al. 1984). This consists of determining the modern ranges of climatic factors that permit the existence of all the species of plants identified in the composition of a given fossil flora, either from pollen or plant macrofossil data. For each plant species, the modern climate ranges are determined and the intersection of all climate ranges of all species present in a given fossil flora determines the climatic conditions that allowed the existence of all species identified in a given sample. The third method was also developed by V.P. Grichuk. It consists of reconstructing the main climatic indices from fossil plant data using a concept developed by Szafer (1946). This author proposed to locate a modern analogue of a palaeoflora by comparing present-day ranges of plants. This method has been widely used to reconstruct the Lateglacial and Holocene climate in the Russian territory (e.g. Borisova 1990, 1997). The accuracy of this method for determining mean summer and winter temperatures has been estimated at about ±1 °C. For annual precipitation, the estimated accuracy is about ±50 mm (Grichuk et al. 1984), assuming no change in plant physiology. Other methods for climate reconstructions using pollen data have recently been developed. These are based on multi-variate statistical techniques. A number of different mathematical techniques, ranging from multiple regressions to correlation analysis, can be used to design transfer functions. The calibration of a statistical transfer function for pollen data requires a collection of modern surface pollen samples that are mathematically correlated to modern climate parameters. Transfer functions have been developed for different parts of the Baltic Sea basin and can be applied to climate reconstructions in the Lateglacial–Holocene period (Seppä 1996; Seppä and Birks 2002; Seppä et al. 2002a, b, 2004a, b, 2005, 2008; Birks 2003; Heikkilä and Seppä 2003, 2010; Antonsson 2006; Antonsson et al. 2006, 2008; Antonsson and Seppä 2007; Birks and Seppä 2010). A calibrated pollen–climate model has been recently developed to quantitatively reconstruct the Holocene annual mean, summer and winter air temperatures in northern Europe and in the Baltic Sea region. The model is based on modern pollen data sets from Finland, Estonia, and southern and central Sweden. Common climatic fields and information-statistical methods have been successfully used to process fossil insect data (Coleoptera and Chironomidae) (Lemdahl 1991, 1997, 1998; Coope and Lemdahl 1995; Coope et al. 1998; Larocque et al. 2001; Walker 2001; Velle et al. 2005; Luoto 2009a, b; Olsson and Lemdahl 2009, 2010). Mean temperature estimates for the Lateglacial –Holocene transition were reconstructed based on coleopteran data from a number of sites in southern Sweden, central Poland and southern Finland (Lemdahl 1997; Coope et al. 1998; Lemdahl and Coope 2007). Continuous beetle records, covering almost the entire Holocene, have been obtained from sites in the uplands of southern Sweden (Olsson and Lemdahl 2009; Olsson et al. 2010) and at three alpine sites in the Abisko area, northern Sweden (Buckland et al. 2011). Fossil Coleoptera (beetles) can serve as a good proxy indicator of Lateglacial and Holocene climate changes in the Baltic Sea basin (Walker 2001). Many palaeoclimatic studies have been carried out in this region showing the presence of Coleoptera assemblages during interstadials (short warmer periods embedded in the glacial periods) that are more thermophilous than modern temperate, boreal or polar assemblages of beetle species. Beetle populations react rapidly to climate change and thus are indicative of contemporary climatic conditions. Coleoptera fauna have been widely employed to generate both temperature estimates and thermal gradients during the Lateglacial period in northern Europe. Chironomids (non-biting midges) are of special interest in palaeoclimatology because their larval head capsules remain well preserved in lake deposits. By using inference models that link present distribution and abundance of chironomids to contemporary climate, the past climate can be quantified from fossil assemblages. Chironomid populations respond rapidly to climate change and occur in a wide variety of modern environmental conditions (Brooks and Birks 2000, 2001; Larocque et al. 2001; Velle et al. 2005; Antonsson 2006; Luoto 2009a, b). Statistical comparison between modern chironomid assemblages and July temperature enables the calibration of statistical models and this provides a basis for quantitative estimates of summer temperature during the Lateglacial period (Velle et al. 2005; Antonsson 2006). Finally, by comparing pollen-inferred temperatures with independent proxy records (e.g. chironomids and oxygen isotopes), it is possible to create a more comprehensive picture of past climatic patterns in the Baltic Sea basin (Rosén et al. 2001). Dendroclimatological data are more successfully used to reconstruct climate in those sites where climate is a limiting factor (such as at the latitudinal or altitudinal boundary of the forest). Various dendrochronological records are used as indicators of climate change and have been used to reconstruct temperature and humidity during the warm season. These comprise tree ring width, wood density, distribution of frost-damaged rings (Briffa et al. 2001), and stable isotopes of hydrogen, oxygen and carbon stored in cellulose. Analysis of radiocarbon (14C) from tree rings has been used to establish high-resolution radiocarbon chronologies. The density of wood in tree rings determined by X-ray densitometry is a much more informative characteristic of past climate compared to the conventional data on tree ring width. In recent times, this technique has been widely accepted, and data on tree ring density of coniferous (predominantly pine and black spruce) and oak trees have been used to reconstruct the summer air temperature over the past millennia (Grudd 2008; Esper et al. 2012). Long Holocene chronologies consist of oak and pine tree ring data from the southern part of Germany and cover large portions of the Lateglacial period, extending into the Younger Dryas back to about 12,000 years ago (Friedrich et al. 1999), see also Chap. 3, Sect. 3.3. The oxygen-isotopic palaeothermometry method is being widely applied not only to organic carbonates of marine origin but also to freshwater lake sediments (algae, lake marl), inorganic carbonate in caves (stalactites and stalagmites), and continental glaciers (mountain glaciers, polar ice sheets) (Mörner 1980; Seppä and Hammarlund 2000; Baldini et al. 2002; Hammarlund et al. 2002, 2003, 2005; Rasmussen et al. 2006; Kobashi et al. 2007, 2008). Among other indications of past climate change in wide use is the diatomic analysis of lake sediments, data on varve width—which may depend on summer water temperature—and archaeological artefacts. Such artefacts (tools, land cultivation traces, ceramics) are primarily indicative of improved climatic conditions in the Baltic Sea basin, in particular increased summer and winter air temperatures and humidity (Pazdur 2004; Poska et al. 2004, 2008; Dolukhanov et al. 2009a, b, 2010). To reconstruct past landscapes and climate, the entire set of available proxy evidence is used. This should render these reconstructions more robust. Table 2.1; Fig. 2.3 show key sections of the data used in this review. The modern Greenland Ice Core chronology (GRIP, NGRIP, and Dye-3) places the Younger Dryas /Holocene boundary at about 11,653 ice years ago (Alley 2000; Rasmussen et al. 2006; Walker et al. 2009). By analysing the 14C isotope content in tree rings, this boundary has been dated to 11,573 cal year BP and by tree ring chronology at ~11,590 cal year BP (Kobashi et al. 2008). This boundary almost coincides with the final drainage of the Baltic Ice Lake at in the Billingen area (central Sweden). Two rapid warming events dated ~14,700 and ~11,500 cal year BP were clearly greater than background climate variability (Mangerud 1987; Björck et al. 2001; Hoek 2001; Hoek and Bohncke 2001; Hoek and Bos 2007; Hoek et al. 2008; Lowe et al. 2008). Between these intervals, the climate varied between alternating centennial warm and cool phases. During a warm episode around ~14,700 cal year BP, air temperatures in ice-free regions of the Baltic Sea basin increased to values close to modern values. This can be inferred from data of changing vegetation (Hoek 2001) and is consistent with modelling results obtained by Renssen and Isarin (2001) with the general circulation model ECHAM4. In their study, ECHAM4 was driven by different reconstructions of sea surface temperature available at the time of publication, by changed orbital configuration and by reconstructions of vegetation cover. Summer air temperatures in ice-free regions reached 13–15 °C as indicated by pollen of Hippophaë rhamnoides (sea buckthorn) and Typha latifolia (cat’s tail). The latest results show that during the Bølling warming 14,500 cal year BP (GI-1e), a treeless tundra community comprising the shrubs Betula nana (dwarf birch), Dryas octopetala (mountain avens) and Salix polaris (polar willow) thrived in the eastern Baltic Sea area (Veski et al. 2012). This warming was interrupted by a series of cold episodes: the Oldest Dryas (GS-2a), the Older Dryas (GI-1d) and the Younger Dryas (GS-1). During the latter period, the cooling lasted for 700–1000 years and the expansion of arboreal vegetation that had started during the Bølling (GI-1e) and Allerød (GI-1a-c) warming was interrupted. The vegetation cover was again replaced by tundra–steppe vegetation typical of the glacial period. During the warmest period of the GI-1a (Allerød) at 13,000–12,700 cal year BP, a pine forest mixed with deciduous trees of the species Betula pendula (silver birch) and Populus tremula (common aspen) developed in the eastern Baltic region (Veski et al. 2012). During the Younger Dryas , the ice sheet still covered a considerable part of Fennoscandia , and sea level was 60–70 m lower than at present. The Baltic Sea basin was filled with freshwater and comprised the Baltic Ice Lake with a dry area where the modern Danish–Swedish straits are located and a land strip 50–80 km wide along the modern coast of the north German and Pomeranian lowlands. The coasts of the Gulfs of Riga and Finland and the Ladoga Lake basin, being subject to a strong glacio-isostatic depression, were submerged (Björck 1995; Mangerud et al. 2007). The cooling at that time has been correlated with the phases of glacial advance that resulted in the formation Salpausselkä I and II ice marginal formation, dated to 12,250 and 11,600 cal year BP, respectively (Rainio et al. 1995; Subetto et al. 2002; Rinterknecht et al. 2004, 2006; Subetto 2009). During the formation of the Salpausselkä marginal formation, the northern lowland part of the Karelian Isthmus formed the bottom of the Baltic Ice Lake, filling with its waters the Baltic and Ladoga basins (Subetto 2009). The sediments of the periglacial lakes and the Baltic Ice Lake in the Gulf of Riga contain the lowest concentration of pollen and spores. At that time, the periglacial vegetation type emerged on weakly developed soils formed under conditions of severe Arctic-like climate. On the Karelian Isthmus, cold and dry climatic conditions and grass–bush (tundra–steppe) associations dominated until 11,000 cal year BP (Miettinen et al. 2007). The Younger Dryas (GS-1) cool phase strongly affected the floral composition of the vegetation. The pine forest collapsed within 100 years in eastern Latvia (Veski et al. 2012). The landscape again became treeless tundra as indicated by pollen spectra dominated by Betula sect. albae, B. nana, Pinus, Salix, Artemisia, Poaceae, Cyperaceae, Chenopodiaceae and Dryas (Ozola et al. 2010). On the shores of the Baltic Ice Lake in the territories of modern Lithuania, Latvia and Estonia open tundra landscapes became widespread. Reconstructions based on the transfer function between modern climate and vegetation assemblage indicate that the mean annual temperature during the coldest period of the Younger Dryas (about 10,500–10,700 14C year BP) was approximately 6 ± 1 °C lower than the present mean annual temperature (Arslanov et al. 2001). Analysis of relic cryogenic forms indicates that permafrost developed in an ice-free territory of the Baltic Sea basin in the Younger Dryas (Mangerud 1987; Isarin et al. 1997). In addition, there is also evidence of activation of aeolian processes (Isarin et al. 1997; Isarin and Bohncke 1999; Kasse 2002), changes in river channel morphology (Starkel 1999) and lake levels and composition of lake sediments (Subetto 2009). Air temperature has been estimated by applying the method of arealograms based on palaeofloristic data (pollen and plant macrofossil data) (Borisova 1990, 1997). The results show that during the coldest phase of the Younger Dryas , deviations of the mean January temperature from the modern value were greatest in north-western Europe, that is, in the Baltic Sea basin. The January temperature there attained values 10–13 °C below the modern level. As at present, mean temperature decreased from west to east, from approximately −14 °C at the Jutland Peninsula to −20 °C on the coasts of the Gulf of Finland . Temperature deviations for the warmest month (July) from modern values were much smaller, about −2 °C on the southern coast of the Baltic Ice Lake. For most of this region, the July temperature in the Younger Dryas was about 13–14 °C (Borisova 1997). In northern Germany, July temperatures were about 12 °C and in central Germany and Poland about 13 °C (Borisova 1990). In Finnish Karelia, they were 7–10 °C, in southern Sweden about 10 °C and in western Poland about 12 °C. In Poland, mean January temperatures were never above −20 °C (Walker 1995). Analyses of the stable isotope content of Lake Gościąż sediments from the middle part of the Vistula River basin suggest that the July temperature was about 10–13 °C in the Younger Dryas (Starkel 2002). An independent reconstruction based on insect fauna composition (Chironomidae) indicates that the July temperature in south-western Norway near the south-western border of the Scandinavian ice sheet (Velle et al. 2005) was 5–6 °C compared to 11 °C at present. In south-eastern Karelia east of the Onega Lake (beyond the limits of the Baltic Sea basin), the minimum July temperature in the Younger Dryas has been estimated at 4 °C by pollen and macrofossils of B. nana versus a modern July temperature of 14 °C (Wohlfarth 1996; Wastegård et al. 2002; Wohlfarth et al. 2002, 2007). Mörner (1980) was the first to quantitatively estimate air temperature changes at the Younger Dryas/Holocene boundary by oxygen isotope analysis of lake carbonates from southern Sweden. This data set showed a rise in air temperature of about 9 °C at the Younger Dryas/Holocene boundary. Independent estimates of the 29N/28N and 40Ar/36Ar ratio in Greenland ice cores showed a temperature increase at the Younger Dryas/Holocene boundary of 10 ± 4 °C and that this occurred within less than 50 years (Grachev and Severinghaus 2005). The first warming in marine sediment (in the Gulf of Riga) is reflected by the dominance of Pinus pollen, the presence of B. nana-type pollen up to 20 %, and pollen and spores of the periglacial plants D. octopetala, H. rhamnoides and Selaginella selaginoides (Kalniņa et al. 1999). The end of the Younger Dryas (11,700 cal year BP) is marked by the rise of Betula pubescens/pendula species and Pinus pollen curves, accompanied by the abundance of their macrofossils and by a decline of B. nana, Artemisia, Chenopodiaceae and Juniperus (core No. 554, No. 989 and No. 15 in the Gulf of Riga, Eini Lake, Svētiņu Lake) (see Table 2.1) Within grass pollen, concentrations of Poaceae and Cyperaceae pollen also increased at this time (Kalniņa et al. 1999, 2011, 2012). In the Early Holocene, a cold and relatively dry climate became suddenly warmer and more humid. The summer temperature in north-western Russia increased from 4 to 10–12 °C (Wohlfarth et al. 2007). In the very first warm phase of the Preboreal around 11,530–11,500 cal year BP, the arboreal vegetation began spreading rapidly in ice-free regions as a result of an abrupt warming (within 50 years or less) and tundra–steppe vegetation dominated by shrubs and grass typical of the Younger Dryas was replaced by open forest associations (Bos et al. 2007). In the earliest warm phase of the Preboreal period, birch and pine started to spread, the former more vigorously than the latter. Periglacial vegetation still occupied large areas in some parts of the Baltic Sea basin. During the initial phase of this warming, the broad-leaved trees appeared in ice-free regions, where Tilia, Ulmus, Corylus and Fraxinus pollen was first found. A shift from clastic–detrital deposition to an autochthonous sedimentation dominated by biochemical calcite precipitation was identified in the Early Holocene by accelerator mass spectrometer (AMS) 14C dating ~11,600 cal year BP of Lake Hańcza (north-eastern Poland) sediments (Lauterbach et al. 2011). The accumulation of silt and clay was replaced by organic-rich gyttja at 11,650 cal year BP also in eastern Latvia (Veski et al. 2012). Within the territory of the present Lithuania, a gradual amelioration of environmental conditions started at about 11,500 cal BP. However, there (Stančikaitė et al. 2004, 2008) and in north-western Russia (Wohlfarth et al. 2007) the change was less pronounced than that recorded in the North Atlantic region (Björck et al. 1996). The early expansion of Picea within the local vegetation, even before 11,500 cal BP, is worth noting. Despite a prolonged discussion involving pollen data, macrofossil finds and modern genetic information, the Lateglacial and Early Holocene history of Picea in this part of Europe is still under debate (Giesecke and Bennett 2004; Latałowa and van der Knaap 2006). Identification of Picea pollen and macrofossil finds suggests the local presence of this tree species during the earliest stages of the Holocene in the north-eastern and northern Lithuania (Kabailienė 1993; Kabailienė et al. 2009; Stančikaitė et al. 2009; Gaidamavičius et al. 2011). Recent evidence of stomata, needles and wood suggests that spruce populations expanded into Latvia during the Younger Dryas (Koff and Terasmaa 2011; Veski et al. 2012). Moreover, the presence of Picea abies suggests a relatively warm climate in this region, with warm summers (~10–13 °C) and moist soil conditions (Giesecke and Bennett 2004) shortly before 11,500 cal year BP. However, changes in the vegetation composition point to the presence of at least two short cold climate episodes between 11,500 and 11,100 cal year BP in north-eastern Lithuania (Stančikaitė et al. 2009). In Latvia, the earliest warm phase of the Preboreal period is marked by the rise of birch and pine curves in pollen diagrams. However, in several diagrams, especially those from the Gulf of Riga (No. 989, No. 15), pollen and spores of periglacial plant (B. nana, D. octopetala) types are still present, albeit more rarely. Their values fluctuate strongly and display a marked spatial variability. Such fluctuations may suggest some climate instability. The pollen spectra characteristic of the Preboreal (PB) can be subdivided into two parts: those corresponding to the Early Preboreal (PB1), characterised by a small increase in Betula along with some increase in different grass pollen; and those spectra, mostly found in the second part of the Preboreal (PB2), where the typical Preboreal pollen is much reduced or completely missing. This can be explained by erosion of the sediment or by much reduced sedimentation rates during the Yoldia Sea stage (core No. 15, see Table 2.1). The warming at the Holocene boundary, at about 11,530 and 11,500 cal year BP was interrupted by a short cold Preboreal oscillation dated using ice core data to 11,430–11,270 cal year BP (Rasmussen et al. 2006; Kobashi et al. 2008). A relatively short cooling phase (about 200–250 years long) occurred approximately 250 years after the final drainage of the Baltic Ice Lake , when seawater flowed into the Baltic Sea basin through the Närke Strait in Billingen due to a rapid rise in sea level resulting from the melting of the Scandinavian ice sheet (see Fig. 2.4). Brackish water entered the Yoldia Sea along the southern coast of the Gulf of Finland and freshwater flowed southwards from the melting ice sheet (Yu 2003). The coldest part of the Preboreal oscillation is dated to ~11,430–11,350 cal year BP. The Preboreal cool oscillation almost coincides with the short brackish phase of the Yoldia Sea whose end has been dated to 11,200 cal year BP (Heinsalu and Veski 2007), which corresponds to the age 11,190 year BP in the GRIP ice core (Bjorck 1999). At the start of the Preboreal cooling phase, sea level was approximately 50 m lower than at present. Subsequent melting of the continental ice sheets (Laurentide and Scandinavian) caused an increase in ocean volume and sea level rose. Pollen stratigraphy clearly suggests some climate instability in the Early Holocene. During its coldest phase, forest tundra and open forest landscapes were established over the greater part of the Baltic Sea basin. This vegetation type remained in some regions until 10,700–10,600 cal year BP. Pazdur (2004) characterised the Preboreal climatic conditions in Poland as cold and dry. At this time, birch expansion that had started during the warming at the beginning of the Early Holocene was interrupted by a dry continental phase characterised by open grassland vegetation (Rammelbeek Phase) (Bos et al. 2007). Within the territory of the present Lithuania, the most prominent climate cooling recorded shortly before 11,100 cal year BP may be correlated with the climate event termed the Preboreal Oscillation (PBO) ca. 11,300–11,150 cal BP, described as a humid and cool interval in north-western and central Europe. Only after 11,100 cal year BP does ongoing forestation of the territory by open forest dominated by birch and pine suggest a climatic improvement that could be interpreted as a delayed Pleistocene/Holocene warming. At the beginning of the Late Preboreal time, between 11,270 and 11,210 cal year BP, there was a sudden shift to a warmer and more humid climate, and forest vegetation expanded once more. Expansion of pine occurred in the later part of the Late Preboreal. This can also be inferred from the increase in organic matter in lake sediments from central Latvia after 11,200 cal year BP, likely to be due to the reduced inflow of minerogenic matter in a denser forest (Puusepp and Kangur 2010). As indicated by the Greenland ice core GISP2 isotope data, at the Preboreal/Boreal (PB/BO) boundary air temperatures increased by 4 ± 1.5 °C (Grachev and Severinghaus 2005). At this boundary between 10,770 and 10,700 cal year BP, dense pine woodland started to expand in the southern part of the Baltic Sea basin (Bos et al. 2007). In north-western Russia, boreal forest comprising Pinus, Picea, Betula, Alnus incana was present at lower altitudes (Subetto et al. 2002). At that time, open landscapes typical of the Preboreal cooling changed to poplar–pine–birch closed vegetation in southern Finland. From 11,000 cal year BP onwards, the glacial boundary retreated fast in the south of the modern boreal belt in Finland, and at about 10,700 cal year BP the region was free of ice, although the ice boundary was still very close. According to estimates made by (Heikkilä and Seppä 2003), between 10,700 and 10,500 cal year BP, the mean annual temperatures were about −3.0 to 0 °C. These temperatures correspond to the modern temperature at 70°N. This climate warming caused the rapid melting of the continental ice sheets. The subsequent isostatic uplift cut-off the Baltic Sea basin from the Atlantic Ocean and lead to its conversion into a large freshwater basin (Ancylus Lake) . The culmination of the transgression phase of this lake is dated to about 10,700 cal year BP (Yu 2003). The Ancylus Lake stage lasted until approximately 9500 cal year BP. The contemporary Baltic Sea basin is part of the last Littorina Stage when significant water level and salinity variations took place (see Fig. 2.5). Beetle data from southern Sweden dated to between ca. 11,000 and 9000 cal year BP (Olsson and Lemdahl 2010; Olsson et al. 2010) suggest temperatures of the warmest month similar to present values. The relatively low numbers of aquatic species imply relatively dry and continental conditions. Reconstructed temperatures based on coleopteran data from Abisko are also similar to present temperatures (Buckland et al. 2011). A temperature rise started after 10,000 cal year BP and lasted until the beginning of the cold event at 8200 cal year BP. Over the greater part of southern Sweden, Estonia, Latvia and Lithuania, open boreal woodlands and sparse birch vegetation were established. Summer air temperatures rose by 7–10 °C above the level attained during the Younger Dryas . However, major environmental changes in the area had begun already in 10,300–10,200 cal year BP, when deciduous trees including thermophilous species spread into the region. According to data from Lake Hańcza in north-eastern Poland (11,600 cal year BP), the shrub pollen content of lake sediments decreased and a shift from clastic–detrital lake deposits to autochthonous sediments dominated by biochemical calcite occurred at the beginning of the Holocene. Warmer conditions ensued, and between 10,000 and 9000 cal year BP pollen spectra showed an increased content of pollen from broad-leaved trees. The organic content of the lake sediments also increased (Lauterbach et al. 2011). Figure 2.6 shows the reconstructed annual mean air temperature for south-central Sweden based on pollen data from Lake Flarken (Seppä et al. 2005). The transition from the Ancylus Lake to the Littorina Sea in the Baltic Sea basin is marked by evidence of a weak brackish phase between 9800 and 8500 cal year BP, called the Early Littorina Sea (Andrén et al. 2011). The ensuing brackish–marine stage is defined by evidence of significantly increased seawater influx (Hyvärinen et al. 1988) and an opening of the Öresund Strait, an event dated to around 8500 cal year BP (Björck 1995; Yu 2003). Between 11,000 and 9500 cal year BP, air temperatures in the Baltic Sea basin slowly raised reaching values of ~0.5 °C lower than at present. A prominent warming started about 9000 cal year BP and lasted until the Holocene thermal maximum (HTM) about 8000–4500 cal year BP, with summer air temperatures 2.5–3.5 °C above modern levels. Davis et al. (2003) reconstructed quantitative characteristics of the climate for the past 12,000 years in western Europe based on analyses of pollen data from more than 500 sections. In northern Scandinavia, summer air temperatures close to the modern levels have been inferred from pollen data (Seppä and Birks 2001) and independent estimates based on chironomid and diatom assemblages (Rosén et al. 2001). The temperature estimates based on macrofossils (for example, tree-line position) indicate a rapid and stable warming after 10,000 cal year BP across the entire northern Scandinavia (Seppä and Birks 2001). Climate reconstructions for central Sweden using pollen spectra from Lake Gilltjärnen sediments show a rapid increase in summer temperatures from 10.0 to 12.0 °C between 10,700 and 9000 cal year BP. This stable positive trend remained until the sudden cooling at about 8200 cal year BP (Antonsson et al. 2006). The ‘8.2 ka cold event’ was first identified from changes in oxygen isotope composition in ice cores from the Summit site in Greenland. The decrease in air temperature during this event has been estimated at 6 ± 2 °C in central Greenland (Allen et al. 2007; Alley et al. 1997; Muscheler et al. 2004; Alley and Ágústsdóttir 2005; Rohling and Pälike 2005; Thomas et al. 2007). An independent method to estimate both air temperature change and the duration of this cold phase, based on the concentrations of δ15N in nitrogen (N2) in ice cores (Leuenberger et al. 1999; Kobashi et al. 2007; Thomas et al. 2007). Kobashi et al. (2007) from the GISP2 ice core data, with a time resolution of ~10 year, showed a complex time evolution of this event. The duration of the entire cold event was about 160.5 ± 5.5 years, the coldest phase occurring at 69 ± 2 years (Thomas et al. 2007). A drop in air temperature of 3 ± 1.1 °C occurred within less than 20 years. Independent estimates of changes in air temperature during this cooling event have been obtained from isotope data from four Greenland ice cores: NGRIP, GRIP, GISP2, and Dye-3 (Thomas et al. 2007). According to the GRIP core data, the event has been dated to ca. 8190 ice years ago. The data from the GISP2 core revealed two milder cool stages: ca. 8220 and ca. 8160 ice years ago. The initial stage of cooling is more explicitly recorded in the NGRIP core data. Independent empirical data, such as marine sediment cores with high resolution, lake sediments, clay varves, speleothem isotope data, and pollen diagrams among others, indicate that the cooling was widespread throughout the entire Baltic Sea basin, except for the most northern regions north of 70°N. The high-altitude glaciation intensified across all regions. In central and southern Norway, the snow line (equilibrium line altitude) lowered by 200 m (Nesje and Dahl 2001; Nesje 2009). The altitude of the upper boundary of arboreal vegetation also lowered (Seppä and Birks 2001; Seppä et al. 2007, 2008). Pollen diagrams from lake and continental sediments provide independent evidence of this cooling. Davis et al. (2003) clearly identified the 8.2 ka cold event across the whole of western Europe, with the lowest air temperatures in areas adjacent to the North Atlantic Ocean (Seppä et al. 2008; Rasmussen et al. 2009). Pollen data from Estonia and southern Fennoscandia indicate a 1 °C air temperature drop (Fig. 2.7). At Lake Rõuge in Estonia, air temperature decreased by 1.8 °C (Veski et al. 2004), which agrees with estimates from pollen data from lakes in different part of Sweden (Lakes Gilltjärnen, Flarken and Trehörningen) (see Fig. 2.8). Lake sediments from four sites—Lake Rõuge (Estonia), Lake Flarken (Sweden), Lake Arapisto (Finland) and Lake Laihalampi (Finland), all located south of 61° N—indicate that the pollen percentage for the thermophilous deciduous tree taxa Corylus and Ulmus, decreased from 10 to 15 % in the Early Holocene to 5 % between 8250 and 8050 cal year BP (Seppä et al. 2007). This implies a temperature drop of 0.5–1.5 °C at all these sites. Here, the cold event lasted 200–300 years and ended by a sudden temperature rise. In Estonia, the cold event lasted longer as indicated by a longer period of vegetation re-establishment after a decrease in annual air temperature of at least 1.5–2.0 °C (Seppä and Poska 2004; Veski et al. 2004). The 8.2 ka cold event has been identified in pollen diagrams from lake sediments from eastern Latvia (Eini, Malmuta) and the Gulf of Riga displaying a decrease in Alnus, Corylus and also Ulmus, and some increase in grass pollen. According to Heikkilä and Seppä (2010), a relatively warm and stable climate was interrupted by cooling at about 8350–8150 cal year BP when mean annual air temperatures dropped by 0.9–1.8 °C. This was reflected in a change in vegetation composition, characterised by a decrease in broad-leaved tree productivity and an increase in the pollen of boreal species (Heikkilä and Seppä 2010). The limit of detection for Ulmus and Tilia pollen is reached in the second part of the Boreal period when their pollen almost disappears before its contribution to the pollen assemblages starts rising again at beginning of the Holocene Thermal Maximum. Re-establishment of Picea in the eastern Baltic Sea region (within the territory of the present Lithuania) is dated to 8600–8000 cal year BP. This short climatic deterioration may have limited the expansion of deciduous trees, providing more space for the expansion of spruce. The expansion of spruce may have been a response to a wet and cool climate with colder and snowier winters (Seppä and Poska 2004). A section containing about 400 layers of varved sediments in west-central Sweden, supported by radiocarbon dating and by dendrochronological data, provides a detailed account of environmental development in this region, identifying an analogue of the 8.2 ka cold event between 8066 ± 25 cal year BP and 7920 ± 25 cal year BP. Snow precipitation increased during this cold period. The estimated duration of the 8.2 ka cold event has been estimated at 150 years (Snowball et al. 2002, 2010; Zillén et al. 2008; Zillén and Snowball 2009). There are no clear changes in the beetle assemblages from southern or northern Sweden that would indicate a cold spell during this time. This may be due to the insufficient time resolution of the data to identify this change. In Germany, changes in the isotope composition of ostracod valve carbonate suggest this cold event lasts for about 200 years (von Grafenstein et al. 1998). Almost all data indicate that the decrease in air temperature was significantly greater in winter than in summer. This promoted an earlier freezing and later thawing of sea and lake surfaces. The causes of the cooling during the 8.2 ka cold event and other cold episodes in the Lateglacial /Early Holocene drew the early interest of researchers (Alley et al. 1997; Barber et al. 1999; Leuenberger et al. 1999; Marotzke 2000; Clark 2001; Clark et al. 2002; Clarke et al. 2004; Alley and Ágústsdóttir 2005; Denton et al. 2005; Kobashi et al. 2007; Thomas et al. 2007; Yu et al. 2010). Although some scientists attribute the 8.2 ka cold event to changes in incoming solar radiation (Bos et al. 2007), most studies relate this cooling and other cooling events in the past 13,000 years to changes in the circulation of surface and deep water in the North Atlantic Ocean driven by melt water from the continental ice sheets. Clark (2001) and Clark et al. (2002) assumed that freshening of the sea surface layer of the North Atlantic Ocean not only disturbed the circulation in the surface layer but also hindered the formation of deep water, thus affecting the intensity and position of the Atlantic ‘conveyor belt’ itself. Drainage of glacial lakes Agassiz and Ojibway due to the melting of the Laurentide Ice Sheet ca. 8470 cal year BP (~7700 14C year BP), during which about 2 × 1014 m3 fresh lake water could have been released within less than 100 years, could have exerted a serious impact on the formation of sea ice, and thus significantly changing the timing of its formation in autumn and melting in spring. Sea ice has a higher albedo than open water, and a longer period of sea ice would cause an additional cooling (Barber et al. 1999; Clark 2001; Ganopolski and Rahmstorf, 2001; Fisher et al. 2002; Clarke et al. 2004; Wiersma and Renssen 2006; Widerlund and Andersson 2011). Pollen and chironomid records show that the period between 7500 and 5500 cal year BP was the warmest for the entire Baltic Sea basin area, although temperatures peaked at different times in different parts of the Baltic Sea basin, with amplitude varying from 0.8 to 1.5 °C and higher. The cold event at about 8.2 ka BP was followed by a warm period with air temperature and annual precipitation higher than present. At that time, forest vegetation with thermophilous species flourished. In northern Finland, the warmest climate of the Holocene occurred between 8200 and 5700 cal year BP, with a temperature maximum at ca. 7950–6750 cal year BP. Pollen diagrams of Lake Tsuolbmajavri, northern Finland, suggest July temperatures around 13 °C. They dropped by 1 °C only after about 5750 cal year BP (see Fig. 2.9). According to the increasing Pinus sylvestris pollen percentages and by the decrease of lycopod and fern spore values, the mean annual sum of precipitation must have rapidly fallen to below 500 mm year−1 ca. 6650–5700 cal year BP (Seppä and Birks 2001), due to still unknown causes. In the north-western part of Russia, forest vegetation with spruce and deciduous trees predominated (Ulmus, Tilia, Quercus). Between 8000 and 4500 cal year BP, summer temperatures were 2.0–2.5 °C and precipitation was 100–150 mm year−1 higher than present (Arslanov et al. 1999, 2001). On the Kola Peninsula, the warm period occurred between ca. 8000 and 4200 cal year BP with summer temperatures peaking around 6000–5000 cal year BP when July temperature was 13.6 °C (Solovieva et al. 2005). Giesecke et al. (2008) reconstructed winter (January) temperatures for the past 11,000 years using pollen data from three lakes (two in central and western Sweden and one in southern Finland) (Fig. 2.10). The highest winter temperatures were found to have occurred between 7000 and 6000 cal year BP. Quantitative reconstructions indicate that the climate in Fennoscandia has become increasingly continental over the past 7000 years, and mostly reflecting winter cooling. These reconstructions suggest that the Early Holocene in Fennoscandia was the most oceanic period, but probably with higher temperature variability . Millennial reconstructions of the North Atlantic Oscillation Index since the Holocene Thermal Maximum until present based on Greenland ice core data suggest a long-term negative trend, and thus increased continentality (Olsen et al. 2012). This is supported by a simulation with the coupled atmosphere–ocean model ECHO-G driven by changes in orbital configuration (Hünicke et al. 2010). Reconstructions of mean annual air temperature by pollen data from Lake Trehörningen in south-western Sweden show that the maximum temperatures 2.5–3.0 °C above the modern values occurred between 7000 and 4000 cal year BP. In northern and eastern Scandinavia, mid-Holocene temperatures were somewhat lower, about 1.5–2.5 °C above present-day values (Antonsson and Seppä 2007). The presence of a number of beetle species during the Mid-Holocene that today are found in central Europe suggests higher temperatures than present in southern Sweden during that period. The mutual climate range (MCR) reconstructions based on stenothermic beetles from Abisko (Buckland et al. 2011) indicate a climatic optimum between 7500 and 6000 cal year BP, with mean summer temperatures about 3 °C higher than at present. In central Sweden, thermophilous vegetation (oak and linden) expanded after 7000 cal year BP. This type of vegetation requires high summer temperatures and is relatively resistant to low winter temperatures. During the warmest period in the Holocene (between 7000 and 4000 cal year BP), the range of Tilia advanced 300 km north compared to its modern position. Over that period, precipitation decreased and lake levels dropped. Near Lake Gilltjärnen (60°N), a maximum mean annual temperature of 6.0–7.0 °C occurred at about 6500 cal year BP, compared to 5.0 °C at present (Antonsson et al. 2006). Reconstructions of summer air temperature in central Sweden using fossil Chironomidae composition show that these temperatures varied within wide limits, from −0.8 to +0.8 °C of its modern values (Brooks and Birks 2000, 2001; Velle et al. 2005). In Estonia, Ulmus and Tilia spread most widely between 7000 and 5000 cal year BP, which coincides with the maximum in summer air temperature. At that time, these species occupied about 40 % of the Estonian territory compared to 1 % at present (Saarse and Veski 2001). Reconstructions based on sediment data from lakes Holzmaar and Meerfelder in the Westeifel Volcanic Field (Germany) show that temperatures were 1 °C higher than at present and declined after 5000 cal year BP (Litt et al. 2009). In Latvia, the warmest climate of the Holocene occurred between about 8200 and 5700 cal year BP with temperatures more than ~2.5–3.5 °C above modern values and a peak warming of about 3.0–3.7 °C at ca. 7950–6750 cal year BP (Heikkilä and Seppä 2010). Temperatures subsequently declined towards present-day values (Figs. 2.8 and 2.9). Deciduous forest appeared here later than in Estonia. Ulmus started to spread in the first half of the boreal period and Tilia at about 7000–5000 cal year BP (Heikkilä and Seppä 2010). With the beginning of the Atlantic warming, mixed deciduous forest composed of Ulmus, Tilia, Alnus, Corylus, and Picea expanded (Mūrniece et al. 1999; Ozola et al. 2010). The maximum values of Ulmus and Tilia pollen are found in the deposits formed in the first part of the Atlantic warming, but the maxima of the Quercus pollen occur in the later period. A short climate deterioration in the central part of the Holocene Thermal Maximum has been identified in pollen diagrams from Eini Lake, Malmuta River mouth (Segliņš et al. 1999) and the Gulf of Riga . The Atlantic warming is clearly identified in pollen diagrams from lagoon sediments. During the second part of the Atlantic period, water level in the lagoon basins gradually decreased. The lagoons gradually filled up and lake sediments record the presence of fen peat with a dominance of Carex species, such as Carex elata, C. lasiocarpa, C. teretiuscula, C. aproximate and Hypnum (Cerina et al. 2010). In Lithuania, the major environmental changes started after 10,300–10,200 cal year BP when deciduous trees, including thermophilous species, spread in this region. In eastern Lithuania, the expanding deciduous taxa, such as Corylus (ca. 10,200–10,000 cal year BP), Alnus (8200–8000 cal year BP), and broad-leaved species such as Ulmus (ca. 10,000 cal year BP), Tilia (7700–7400 cal year BP) and Quercus (5200 cal year BP), formed a dense mixed forest. Picea reappeared at 7300–6800 cal year BP (Gaidamavičius et al. 2011). In north-western Lithuania, immigration of Corylus was dated back to 7600–7200 cal year BP, Alnus—back to 7300–6900 cal year BP, and Ulmus—back to 8100–7500 cal year BP (Stančikaitė et al. 2006). After about 9800–9900 cal year BP, the expansion of deciduous species was accompanied by the spread of Cladium mariscus (L.) Pohl, suggesting that minimum mean July temperature increased up to +15.5 °C even in the northern part of the country. Development of deciduous forest requires moist and fertile soil and high humidity . Therefore, its expansion confirmed that such ecological conditions pre-existed there. The Holocene Thermal Maximum, ca. 8000–4500 cal year BP, with dryer and warmer summers reflecting stronger continentality (Seppä and Poska 2004), was generally responsible for expansion of deciduous trees to the eastern Baltic Sea region. These taxa continued to flourish there between about 7500 and 4200 cal year BP (Stančikaitė et al. 2003, 2004, 2006, 2008, 2009; Giesecke and Bennett 2004; Giesecke et al. 2008; Gaidamavičius et al. 2011). In central Poland, Tilia and Quercus appeared about 9300 cal year BP. However, they did not become widespread until 8000–7000 cal year BP. At the same time, Alnus—and in mountainous regions, Picea—spread widely. Then, at about 5000 cal year BP, the climate became wetter and colder (Pazdur 2004; Lauterbach et al. 2011). It should be noted that the first signs of anthropogenic deforestation are recorded at 6500 cal year BP in this region. For northern Europe as a whole, Davis et al. (2003) dated the well-defined thermal maximum of the Holocene at ca. 6000 cal year BP. For the Baltic Sea region, the highest temperatures occurred around 6500 cal year BP and were 1.5–2.5 °C above present-day values in the north-west area and 1.0–1.5 °C in the north-east. As is clear from Figs. 2.7, 2.8 and 2.9, climate has been relatively unstable across the Baltic Sea basin over the past 4500 years, with alternating warm and cold periods superimposed on a general cooling trend. Different proxy data indicate a two-stage air temperature decrease in the Late Holocene. The first occurred between 5000 and 4500 cal year BP and the second between 4300 and 3300 cal year BP. During each of these periods, the temperature drop was at least 1 °C. A warming at ca. 3200 and cooling at ca. 2800 cal year BP are revealed by detailed palaeoclimatic reconstructions (Zubakov and Borzenkova 1990; Arslanov et al. 2001; Bjune et al. 2009). Although the general trend of the Late Holocene cooling is probably related to decreased summer solar radiation due to astronomical factors, the causes of the superimposed oscillations are still unclear. Climate cooling in north-western and northern Russia and other regions of the Baltic Sea basin started at about 4500 cal year BP. A warmer period at about 3500 cal year BP and a colder period at about 2500 cal year BP are apparent, superimposed on the general cooling trend (Arslanov et al. 2001; Subetto et al. 2006). Analyses of Lake Igelsjön sediments in southern Sweden suggest that relatively warm conditions remained until 4700 cal year BP, followed by an abrupt hydrological shift to cooler and/or wetter conditions by around 4000 cal year BP (Jessen et al. 2005). A cooling trend thereafter, up to pre-industrial times, was punctuated by a series of short rapid warm fluctuations. Pollen diagrams show changes in vegetation composition and a distinct decrease in thermophilous species (primarily Corylus). About 2000 cal year BP, the temperatures were already close to modern values (Jessen et al. 2005). Proxy data reconstructions show that a trend towards cooler and wetter conditions prevailed across Fennoscandia during the past 2000–1500 years (Bjune et al. 2009; Esper et al. 2012). These climate trends are shown by, for example, δ18O records from lake sediments (Hammarlund et al. 2003; Rosqvist et al. 2007), tree ring-inferred summer temperature and pollen data. The mean July temperature reconstructions based on these data obtained from 11 lakes located in the different landscape zones in the northern parts of Norway, Sweden, Finland, and north-western Russia are shown in Fig. 2.11. In Poland, analyses of lake sediments of the Late Holocene, including pollen spectra, indicate that lake levels rose and peat mires developed at this time. Between 5000 and 4200 cal year BP, the climate was relatively warm and dry, but by the end of this period became more humid. The dominant species in forest associations changed slightly. In the mountains, spruce expanded and Carpinus and Fagus migrated from the south-east into this region. At about 3500 cal year BP, Abies spread from the south-west and became a forest-forming species in southern Poland (Kulesza et al. 2011). Picea spread to the north-east of Poland and Fagus penetrated this region from the west. Pazdur (2004) showed that the Subatlantic period started about 2800 cal year BP. According to Heikkilä and Seppä (2010), summer air temperature dropped by ~3°C in Latvia during the Late Holocene. Pollen diagrams show changes in vegetation ; a significant decrease and almost disappearance of the thermophilous broad-leaved species and Corylus. The dominant tree species over the past 3000 years was Pinus and Betula (Mūrniece et al. 1999; Kalniņa 2008; Kuške et al. 2010b), except in the central part of the Subatlantic period when the Picea pollen curve, and to a lesser extent Alnus and Quercus, rose again. Dwarf shrub (mainly Ericales) and grass pollen (Poaceae, Cyperaceae) concentrations increased during the past 1000 years, reflecting a decrease in forest cover, which resulted from both climatic and human impacts (Ozola et al. 2010; Kalniņa et al. 2012). Analyses of isotopic strontium concentrations in molluscs can give information about past salinity in the Baltic Sea (Widerlund and Andersson 2011). Data suggest that the difference in surface salinity in the various Baltic Sea basins has been much less in the past that now and that the general trend over the past two millennia is towards freshening, with this trend strongest in the Bothnian Bay . These results would be consistent with a decrease in summer evaporation caused by increasingly colder summers, or with an annual increase in precipitation . Since the seasonality of the orbital forcing is quite different from that which is likely for a GHG-forced future climate, an extrapolation of these trends is not justified. Over the Holocene, the Baltic Sea area has undergone major changes due to two interrelated factors. First, the demise of the Fennoscandian ice sheet that had previously accumulated as part of the 100-thousand-year-long glacial cycle. This demise started around 18,000 years ago, but due to the long timescales involved in land-ice dynamics and the slow crustal readjustment to the disappearance of the weight of an ice sheet 3 km deep, its effects are felt throughout most of the Holocene. The most important effect of the melting of the ice sheets is an interplay between global sea-level rise due to the increase in the ocean volume and a regional isostatic rebound (uplift) of the earth’s crust. This interplay led to a series of transitions of the Baltic Sea basin as a brackish sea or freshwater lake, with periods of isolation and periods of interchange with the North Sea. The modern configuration of the Baltic Sea as a brackish Mediterranean or inland sea was established around 4500 years ago. Second, changes in the orbital configuration of the Earth. This is thought to be the major trigger for glacial to interglacial transition, but also modulated solar insolation to the high northern latitudes during the Holocene and thus strongly influenced the energy balance of the Baltic Sea area. Summer solar insolation modulated by these changes peaked around 7000–6000 years ago. Its effects were recorded in a phase of warm temperatures, extended vegetation cover and a progressive millennial cooling thereafter. The instruments used to reconstruct the climate of the Baltic Sea area during the Holocene are multifaceted. Palaeobiological and geochemical records that, at least partly, reflect past environmental conditions can be used to reconstruct past temperature and/or precipitation in some seasons. Among these, the more widely used are pollen and spore assemblages derived from dated lake sediments, tree ring data, and fossil remains that may be indicative of the spatial spread of thermophilous or halophilous species and thus may give information about past temperatures or salinity. The Baltic Sea area underwent a series of climatic phases during the Holocene. The Younger Dryas occurred in a transitional period between the Last Ice Age and the Holocene and ended around 11,500 years ago. Temperatures then rose, land ice partially disappeared, and the earth’s crust rose causing a drop in relative sea level, giving rise to a large freshwater lake (Ancylus Lake). As temperatures and sea level continued to rise (due to the melting of the northern hemisphere ice sheets), a connection was established between the North Atlantic Ocean and Ancylus Lake forming the brackish Littorina Sea. The rise in temperature was interrupted by another climatic cold event, however, about 8200 years ago which is thought to have been caused by freshwater drainage from the North American ice sheet into the North Atlantic Ocean. This event was shorter and less intense than the Younger Dryas, with a drop in temperature of about 2 °C lasting for about 200 years. This event was the last cooling episode of the Early Holocene and was followed by a stable and relatively warm period with summer temperatures 1.0–3.5 °C higher than at present. The period between 7500 and 5500 years ago was the warmest in the Baltic Sea basin area as a whole, although the timing of maximum temperatures was not synchronous in different parts of the region. Thereafter, a trend of northern hemisphere cooling and increased climatic instability began, typical of the Late Holocene interval. Temperatures in the Baltic Sea region started to drop around 5000–4500 cal year BP coincident with decreased summer solar insolation due to the quasi-cyclical changes in the Earth’s orbit. The climatic variation during the Lateglacial and Holocene is reflected in the changing lake levels and vegetation and in the formation of a complex hydrographical network that set the stage for the Medieval Warm Period and the Little Ice Age of the past millennium.